Linetta Ballew returns to Brethren Woods! Brethren Woods Camp & Retreat Center is pleased to announce that Linetta Ballew has been hired as our new Assistant Director! The Assistant Director role will combine the Program Director role with additional administrative systems responsibilities as part of a transitional leadership model. Linetta was raised in Martinsburg, WV, Everett, PA, and Bridgewater, VA by her parents, Robert and Linda Alley. She is a middle child and has an older sister (Leanne) and younger brother (Jonathan). Important influences in her early life included her home congregations, district and denominational events, workcamps, and summer camp. Through high school and college, she worked as a summer staff counselor, lifeguard, and program coordinator at nine different Church of the Brethren camps and was a member of the 1998 Youth Peace Travel Team. Linetta is a 2002 graduate of Bridgewater College where she studied biology and history. She earned her Masters of Divinity degree from Eastern Mennonite Seminary in 2009 with an emphasis in congregational education. Linetta is an ordained minister within the Church of the Brethren since 2013. Linetta met her husband, Joel, while they were attending Bridgewater College. They were married November 15, 2003 and are looking forward to their 15th wedding anniversary this fall. They have three children. Julian is a spirited 8-year-old with a creative, engineering mind who is always thinking outside-the-box. Nicholas turns 6 years old in November. He enjoys helping out with projects in and out of the house and loves tractors (especially John Deere ones)! Both boys take piano lessons and have recently joined the Cub Scouts. Hannah is a delightful 2-year-old who has no trouble keeping up with her two older brothers and provides an interesting balance to our family. She enjoys coloring, reading books, dress up, and riding toys. All of us love to be outside, traveling, and going on adventures together – especially to national parks! Linetta has over 15 years of full-time experience in the field of camping and outdoor ministry. 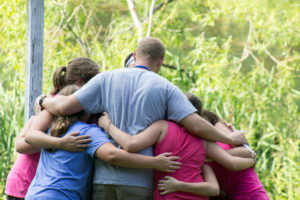 From December 2003 to May 2013, Linetta served as the Program Director at Brethren Woods overseeing all aspects of the camp program including summer camp, outdoor school field trips, the challenge course, and weekend retreats. Her work also included the hiring, training, and supervising of paid and volunteer staff members, as well as managing routine and event based publicity and assisting with fundraising and public relations efforts. 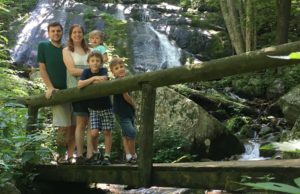 Since May 2013, Linetta has shared the position of Administrator at Camp Swatara (Bethel, PA) with her husband, Joel. Her primary work there was focused on the retreat/rental ministry, staff hiring and supervision, and working to create and update systems and policies. In addition, she worked on public relations efforts, visioning and goal setting, technological advancements, and fundraising, including a capital campaign and its various improvement projects. She continues to be involved in the wider Church of the Brethren outdoor ministry network and is currently serving on the denomination’s Outdoor Ministry Association Board as the Chairperson. Linetta brings strong skills in program development and implementation, staff hiring and training, organization, administration, publicity, public relations, and non-profit leadership. She is an articulate public speaker, creative thinker, and collaborative leader who works hard and seeks to be faithful in all that she does. Most importantly, she has a sincere belief in the importance of outdoor ministry and senses God’s call to serve God and the church in this type of ministry setting. Linetta has consistently demonstrated a commitment to cultivating new opportunities for progress and growth wherever she is. She is excited about the opportunities to work in a more direct and influential way with the camp program and overall ministry, especially aspects related to Christian education, spiritual formation, outdoor recreation, and leadership development for campers, staff, and all participants. She hopes to support and strengthen Brethren Woods through her work here and looks forward to working with the other staff and many committed volunteers to help make that happen.